Golden Times - Buftea Lake Resort (Baza Turistica Buftea) is situated on the lake Buftea, 20 km north-west from Bucharest's city centre. Golden Times is a resort close to Bucharest, a good weekend destination, providing accommodation within two bedrooms bungalows, an outdoor swimming pool, a restaurant and a garden. Among the sports you can enjoy here: cycling, hiking, table tennis, fishing. Locals in Bucharest have reviewd Golden Times - Buftea Lake Resort - Sport venues in Bucharest. 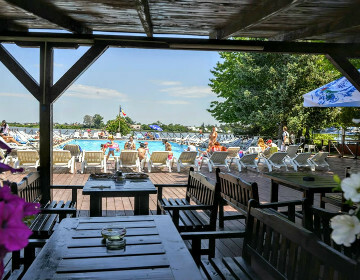 You can find here description, reviews, address, map, phone, website of Golden Times - Buftea Lake Resort in Bucharest. Visit Bucharest Tips for more Sport venues in Bucharest!